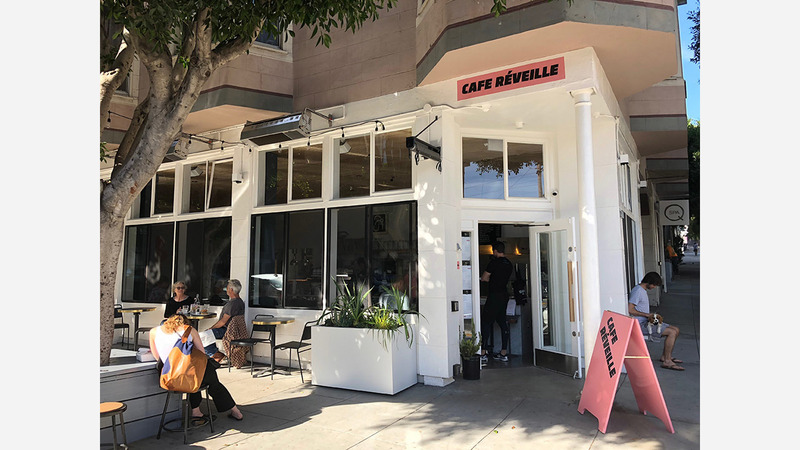 A long-quiet spot at the corner of Steiner and Waller is once again a coffee shop: Cafe Reveille opened its Lower Haight location yesterday afternoon. As we reported in September, the small local chain founded by brothers Christopher and Thomas Newbury was set to open its fourth location in December, but Thomas told Hoodline that they postponed the opening to make sure they were ready. The location has been a source of controversy; when Bean There lost its lease in 2016 after a 21-year run, Blue Bottle proposed taking it over, which didn't sit well with residents who opposed formula retail. Last May, Planning denied the roastery, which has since been acquired by Nestle, a required conditional use permit. According to city documents, six tables and 13 chairs are permitted on the sidewalk, and the owners have installed heaters on the facade to make it more comfortable for al fresco dining. In December, the Newburys filed for a conditional use authorization to upgrade the location's designation from cafe to restaurant. Thomas said that they're currently in a soft opening phase with a limited menu that includes breakfast, lunch and a light brunch. Offerings include healthy bowls or sandwiches, veggies, as well as pasta and orders may be placed online. If plans come together, the brothers will add beer, wine and dinner to the menu next month. Cafe Reveille employs about 15 people at the Steiner Street location and will expand its food concept to other locations in the city, he said. The neighborhood response has been great so far, said Thomas, adding that he thinks the Lower Haight is a cozy, charming part of the city. Cafe Reveille is open from 7am to 6pm from Monday to Sunday at 201 Steiner St. Food is served from 7:30am to 3pm.